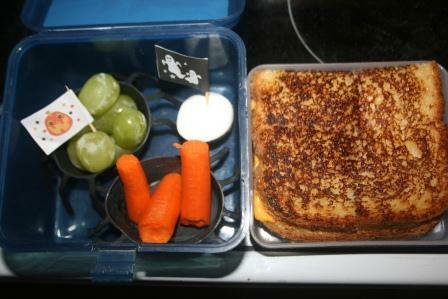 Another Muffin Tin Monday bento lunch for Pierce! Pierce really loves grilled cheeses. This was a simple lunch. Grilled cheese on homemade bread, carrots, grapes, and a marshmallow for dessert. The carrots and grapes were in spider muffin tin cups. I added a couple of Halloween picks to jazz this up a bit, especially now that it's October! For more fun lunch ideas for kids, check out Muffin Tin Mom. Grilled Cheese - A FAVE! Very creative! I love to eat grilled cheese sandwiches year round. This one looks delicious! You are making me hungry with the grilled cheese sandwich. I miss cheese.... and real bread. It looks so good. Your Halloween Picks are very cute. Halloween is coming right up soon isn't it. Oh Lisa I only have on complaint you always make me want to have someone here making my breakfast and it never happens. grilled cheese is my absolute favorite, that one is cooked beautifully!! it matters, you know!! awww to be young again & have mom make you a grilled cheese!! Do you know what makes a good, fast grilled cheese sandwich? A Quesadilla maker. It grills both sides at once, it adds the crusty cheese on the sides, and it puts patterns in the bread. My sister-in-law gave us one, one year. I don't make a ton of Quesadillas, so I was thinking of other uses as well. I love grilled cheese sandwiches too--I bet it's delicious on your homemade bread! Grilled cheese is something Andy will eat too. Grilled cheese was my favorite thing to eat as a child. It was never presented as creatively as this, though! this is a lunch i'd love! Mmm...grilled cheese. One my favorite lunches in autumn. Great idea! Love the Halloween picks! Man....I haven't had a grilled cheese in years! Looks wonderful to me. Grilled cheese is my favorite comfort food! Lucky boy! Now I want a grilled cheese! That's comfort food to me. I love the grilled cheese for lunch. Perfect for fall. Hummm...I think I would like that!!! Grilled cheese sounds delicious - perhaps I should try to fix it. Yum, grilled cheese! I haven't had one in a long time! I wonder if my comments are going into your spam box!! I'm with Pierce. Grilled cheese are one of THE best sandwiches known to mankind. And who can resist spider cups? :-) Lisa, you are such a fun mom! I love grilled cheese with sharp cheddar...yummy!